Overview: SoftList offers an extensive set of features with a modern and intuitive visual. Create your shopping list quickly using our product catalog and with the help of the autocomplete resource. You can create lists by just adding the names of the products or complete lists by adding price, unit of measure, category, observation and photo. Add the price of the products and let SoftList calculate the total purchase for you. By saving the history of your purchases, you can perform an analysis of your expenses, and if you have purchased the same product in different stores, perform price comparisons. SoftList is the only shopping list app that has reports and charts to analyze your expenses. You can analyze various information, such as which product or category had more expenses. Just save the history of your purchases and generate reports. With cloud services you can synchronize your data between multiple devices, share lists with others and keep all your data saved in the cloud through automatic backups. To use the cloud services you need to create a SoftList account. You can create this account at any time, even after creating your lists. 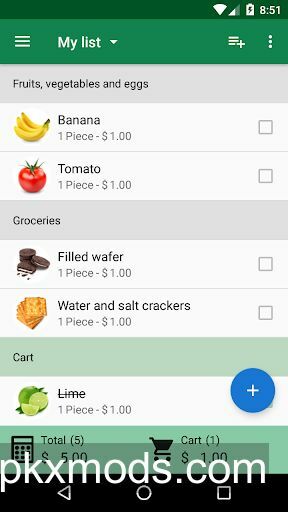 – Register and manage your shopping lists. – Catalog of products with images. – Register items manually, using voice command or by scanning the barcode. – Add images to the products. – Products arranged by categories. – Possibility to define the order in which categories will be displayed. – Share your shopping list by email, SMS or WhatsApp. – Copy and move items between lists. – Add price to the products and see the total purchase. – Save your purchase history. – Reports for monitoring expenses. – Reports to compare prices. – Share lists with others. – Automatic backups using cloud services. – Synchronize your data between multiple devices. SoftList is now avaliable on Android Wear smartwatches. – Added field in the Product Catalog for quick insertion of items. – Added option to display the amounts in expenses report.